What's a dog-and-pony show without some kind of award? At this year's LA Auto Show they'll be awarding Green Car Journal's fourth Green Car of the Year Award to one of five finalists. The competitors this year are the yet-to-be-unveiled 2010 Ford Fusion Hybrid, the BMW 335d, Saturn Vue 2-Mode Hybrid, Smart Fortwo and Volkswagen Jetta TDI. The winner will be announced at a November 20th press conference, and we know which one we'll be pulling for - the 2010 Ford Mustang. Complete details, if you're into that kind of thing, below. GREEN CAR JOURNAL'S TOP 5 FOR 2009™ ANNOUNCED – ONE TO BE NAMED 2009 GREEN CAR OF THE YEAR® AT LOS ANGELES AUTO SHOW Winner to be Unveiled at a Nov. 20 Press Conference LOS ANGELES – Oct. 30, 2008 — Green Car Journal's Top 5 for 2009™ – the year's best-of-the-best 'green' vehicles - have been identified by the magazine's editors. These vehicles are the five finalists competing for the Green Car Journal's 2009 Green Car of the Year® award: the BMW 335d, Ford Fusion Hybrid, Saturn Vue 2-Mode Hybrid, smart fortwo and Volkswagen Jetta TDI. The 2009 Green Car of the Year will be unveiled at a morning press conference on Nov. 20 during Press Days at the Los Angeles Auto Show. The five models are important milestones for their manufacturers. The VW and BMW clean diesels are leading edge models signaling the advent of highly efficient, advanced diesel sedans that meet emissions certification in all 50 states. 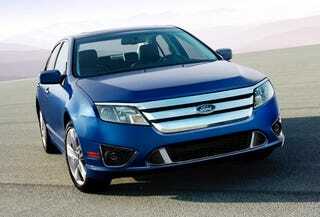 Ford's Fusion Hybrid, a full hybrid, is this automaker's first hybrid sedan. Saturn's Vue 2-Mode is GM's first application of its two mode hybrid system in a V-6 front-drive platform. The smart fortwo is a new-for-the-U.S., fuel efficient micro car with a small eco footprint. "This is an exciting year for 'green' cars because of the many innovative and advanced models now emerging," said Ron Cogan, editor and publisher of the Green Car Journal and editor of GreenCar.com. "In fact, this year's selection of nominees was more challenging than in years past because of the auto industry's greater emphasis on greener vehicles and the number of potential vehicles to consider. For the first time, we've also seen a pair of clean diesels and a small gasoline model giving hybrids serious competition." Green Car Journal's Green Car of the Year program focuses on recognizing new model vehicles that provide real answers for new car buyers looking for a personal stake in lessening environmental impact. This may be through substantial improvement in fuel efficiency, lower emissions, use of an alternative fuel, or an overall lower environmental load. Green Car Journal editors perform an exhaustive review of vehicle models to identify those that merit consideration for the Green Car of the Year program. Vehicles using all types of technologies, fuels, and powerplants are eligible. To qualify for consideration as a nominee in the 2009 Green Car of the Year program, a vehicle must exhibit characteristics that substantially raise the bar in environmental performance and be in production by January 1 of the award year. Plus, a potential nominee must be driven by Green Car Journal to allow first-hand evaluation of driving dynamics. The 2009 Green Car of the Year will be selected by a jury comprised of nine jurors. These include Carl Pope, executive director of the Sierra Club; Frances Beinecke, president of the Natural Resources Defense Council; Jean-Michel Cousteau, president of Ocean Futures Society; automotive expert and "Tonight Show" host Jay Leno; and automotive icon Carroll Shelby. Four Green Car Journal editors round out the jury. About Green Car of the Year® The Green Car of the Year® award is an important part of Green Car Journal's mission to showcase environmental progress in the auto industry. Since 1992, Green Car Journal has focused on the intersection of automobiles, energy, and environment, first with an industry newsletter and then with an award-winning auto enthusiast magazine. Today, the magazine is considered the premier source of information on high fuel efficiency, low emission, advanced technology, and alternative fuel vehicles. Green Car of the Year® is a registered trademark of Green Car Journal and RJ Cogan Specialty Publications Group, Inc. About the Los Angeles Auto Show For the third year in a row, the Los Angeles Auto Show will be held in the fall. Green Car Journal has been unveiling the Green Car of the Year® winner at the Los Angeles Auto Show every year since it initiated the annual award in 2005. The show opens for media only Nov. 19-20. Media registration is now open and the deadline to register online and still receive credentials in the mail is Oct. 31. Online registration will remain open until Nov. 6 but credentials must be picked-up on site. Public days run from Nov. 21-30. For general information visit www.LAautoshow.com.